Say all want you about the super rich, but some of them donate a lot of money. The 50 most generous donors in the U.S. gave away $9.8 billion in 2014, according to The Chronicle of Philanthropy. That figure was up 28% from the year before, driven largely by a rise in the number of tech entrepreneurs donating millions of dollars, as well as a huge donation ($1.5 billion) from Bill and Melinda Gates. The top 50 givers run the gamut, proving that there's definitely more than one way to make money. And their donations can reveal little-known facts about the lives of the ultra-wealthy. There are a lot of big names on this year's list, but here's just a taste of some of the donors, how they got rich, and where they're giving (in no particular order). You can get really rich running truck stops. The Haslam family has operated a chain of truck stops throughout the U.S. since the 1950s and they also bought the Cleveland Browns football team in 2012. Last year it donated $50 million to the University of Tennessee at Knoxville's business school. Napster's Sean Parker has life-threatening allergies. He's allergic to peanuts, tree nuts and shellfish, so he donated $24 million in December to start an allergy research center at Stanford University. You can also get really rich selling collectables and sports memorabilia. Ted Stanley's company, MBI, got its start selling a series of medals commemorating the 1969 moon landing. The 83-year-old is giving $650 million to scientists at MIT and Harvard to research the genetics behind disorders like autism. Microsoft co-founder Paul Allen made the largest private donation ever to the Ebola fight. The Microsoft (MSFT) co-founder pledged $100 million to groups like the American Red Cross, the Centers for Disease Control, and Unicef to fight the disease. Buffalo Bills owner Ralph Wilson never won the Super Bowl. Wilson founded the Bills in 1959 and was the sole owner until his death last year, but his team never won the big game. One big success that he did have: Wilson gave away more money than anyone in the U.S. last year after Bill Gates, donating about $1 billion to several different charities. Young tech guys are super generous. 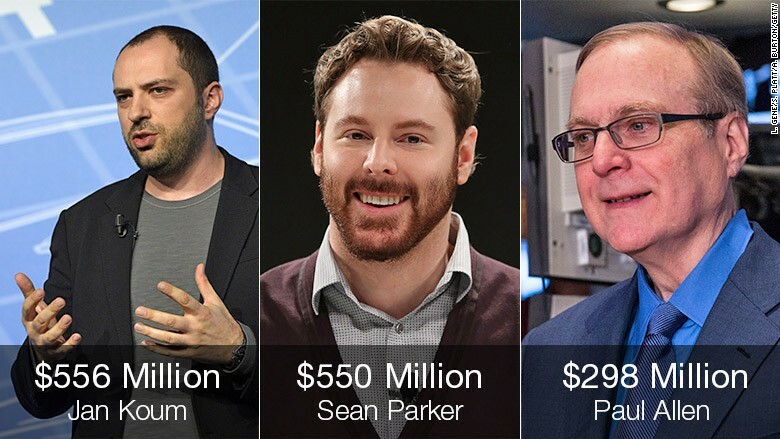 Three tech entrepreneurs under the age of 40 landed donated more than $500 million each: WhatsApp's Jan Koum, Sean Parker, and GoPro (GPRO) founder Nicholas Woodman. While Parker is giving his money to allergy research, Koum and Woodman have kept quiet about where exactly the money will go.